Tom Cooper, Director of the Tyler County Office of Emergency Management, occupies storage and office space in the Paden City Industrial Park through a lease agreement with the Tyler County Commmission and the Paden City Development Authority. On a recent visit to the site, Cooper gave a detailed description of the equipment and supplies his office currently manages. Inside the building, located on the South end of the Industrial Park, is approximately 40,000 square feet of space available to the OEM. Cooper, along with county volunteers and LEPC members, have an array of emergency equipment to their disposal. “Everything here is for the citizens of Tyler County. 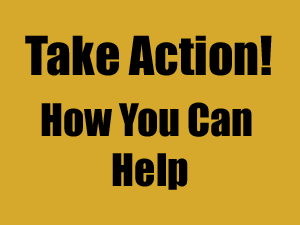 We have search and rescue equipment, emergency supplies, temporary shelters, communication devices, bottled water, first aid equipment, trailers set up for disasters, and much more. However, everything here is available, not only for the local people, but anyone in the state who may need assistance,” Cooper said. To say the amount of equipment, -which also includes at least 15 trailers, all which are full of supplies and materials in case of disasters – is impressive would be an understatement. Cooper and a handful of volunteers have put together a treasure of life-saving equipment. 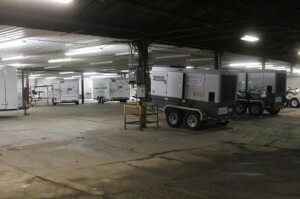 There is anything from communication devices to generators powerful enough to power the city of Paden City if needed. 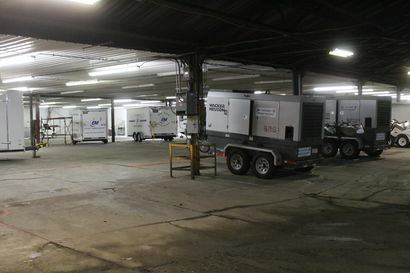 Two huge generators, portable lighting, and training equipment for search and rescue dogs are located in the warehouse. One trailer, which is known as the command center, houses several computers and weather forecasting machinces hooked into the National Weather Service. These centers include radios, televisions, and meeting rooms, along with outside electrical outlets for the generators to run the trailer in rural areas. Also in the storage area is a trailer with several smaller generators for emergency use and two water rescue boats, one which is state-of-the-art and another which has been in use for around 19 years. Cooper also gave a brief tour of his office space, which includes phone lines computers, monitors, and way too much to list. Cooper, who formerly worked in local industry, said he recognizes the needs of industry, and he recognizes there are ways they can help the communities in which they are located. He pointed out, as an example, two fork lift trucks which he said were donated by a local plant. According to Cooper, the OEM has had a need for both of them, and currently one is on loan to another facility. He said one was used to lift water and food a couple years ago when power was out in the county due to a major storm. While speaking about the two boats, Cooper said they are set up for the dogs that are trained to find bodies in water. He showed where the dogs sit and how they can move from the front of the boats, along the side, sniffing the water for scents. He said the small boat was actually used to locate a body in the Ohio River, with the assistance of one of the dogs provided by trainers and owners who partner with Tyler County. He said some are even members of the Tyler County LEPC. You are correct, Ed. My oversight, too much of a rush. I’ve made the correction. P.S. The Tyler Star News is a quality weekly newspaper. I’ve been reading it since 1946. SISTERSVILLE — A Tyler County man was flown by medical helicopter Tuesday evening to Ruby Memorial Hospital in Morgantown after he carried out a threat to blow up his trailer home. According to the Tyler County Sheriff’s Office, Michael Lee Cooper of 6684 Tyler Highway in Sistersville reportedly left a message on a friend’s phone Tuesday afternoon stating that he had filled his trailer with gas and propane. Deputies from the sheriff’s office responded to the scene and made phone contact with Cooper. Deputies said Cooper made threats to his own life and attempted to lure officers into the residence. According to reports, Cooper also made threats to the officers’ lives. He was kept on the phone for more than two hours in an effort to end the situation without incident, officials said. However, Cooper refused to leave the residence. After losing phone contact with Cooper, officials continued to monitor the residence and shut down W.Va. 18 for safety reasons. At about 6:53 p.m., officers made phone contact again with Cooper who said he would come out of the residence. Before exiting the residence and while on the phone with a deputy, Cooper attempted to light a cigarette. This cause an explosion that engulfed the trailer in flames. About a minute later, Cooper fell out of a window and landed on the ground. Officers carried him to safety and Cooper was then transported by Middlebourne EMS to a medical helicopter transport pad in New Martinsville. From there he was flown to Ruby Memorial Hospital in Morgantown. The Tyler County Sheriff’s Office was assisted by the West Virginia Fire Marshal’s Office. Additional officers from Middlebourne, Sistersville, Paden City, and Shirley and Alma fire departments and Middlebourne EMA assisted at the scene.